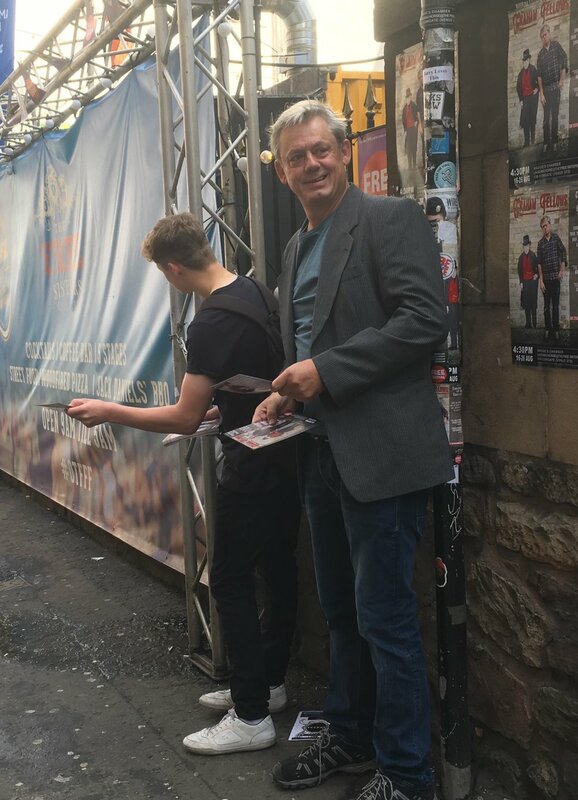 On the home straight now at the Edinburgh Fringe where I’ve been performing my Completely Out of Character show. I’ve also been learning how to flyer my own shows which I’m embarrassed to say I’ve never done before. It’s a rewarding and humbling experience, as is performing the show itself - especially when people walk out midway through my big hit ‘Jilted John’! Mind you, they were from Holland and aged about 19. I finish my trip up North with a gig on Monday at the Glasgow Stand at the very respectable time of 6pm. Glasgow fans please come as it’s your last chance to see this show north of the border. On the way up to Edinburgh I did a show at the Newcastle Stand where I was joined on stage by the amazing Niopha Keegan (of the Unthanks) who played violin on Diary of a Skinbird (as she does on the CD version). You can watch the performance here. It’s Jilted John rehearsals next for the ‘Ere We Go 2 3 40’ tour in October. I’m on the lookout for a vintage quilted anorak with a hood, if anyone has one going spare..? Newer PostOut of Sorts and Out of Character - again!